How safe is your city for motorists? A new NerdWallet analysis examined the risks for those who drive in nearly 200 of the nation’s most populous cities. We looked at car crashes and the number of fatal accidents, vehicle-related crimes and other factors to determine which cities are the safest and which places are the most dangerous for drivers. Then we factored in car insurance quotes for the average driver in these cities and found some surprising differences. NerdWallet ranked the nation’s biggest cities to find a score based on five metrics: the rate of fatal crashes, the likelihood of an accident relative to other cities, the number of years between accidents, the risk of auto larceny — a break-in — and the risk of having a vehicle stolen. We compared the total scores based on those metrics with the auto insurance rates in each city, analyzing the average annual cost of insurance given the legal requirements for that state and the most affordable insurers among the largest companies in that market. Larger cities tend to be more dangerous. The average population of our 20 safest cities is 208,944, compared with an average population of 488,710 for the 20 most dangerous cities. However, not all big cities are riskier for drivers: The nation’s largest city, New York City, is the 34th safest, according to our analysis. Drivers face higher risks in cities in the South and East Coast. Thirteen of the 20 most dangerous cities are located in the South or on the East Coast. Twelve of the 20 safest places are in the Midwest and West, and three of the 20 safest places for drivers are in Arizona. Auto insurance rates are 47% more expensive in our most dangerous cities. The average annual insurance rate in our 20 most dangerous cities is $1,721, compared with $1,169 in our 20 safest cities. In Detroit, our most dangerous city for drivers, you’ll pay 642% more, on average, for car insurance than in our safest place, Cary, North Carolina. Of all cities analyzed, Detroit has the second-highest fatal accident rate per 100,000 residents at 16.2. The average annual cost of insurance in Detroit ($5,409) is $4,680 higher than that of our safest city for drivers, Cary, North Carolina. As with four of our five most dangerous cities for drivers, Detroit received ratings that fall within the “least safe” range for car break-ins and stolen cars. Baton Rouge recorded 38 fatal crashes in 2014. Though the number is far fewer than Detroit, which had 110 fatal accidents, Baton Rouge’s population is much smaller, which means its rate of 16.6 fatal crashes per 100,000 residents is the highest in our analysis. But Baton Rouge fared better than other cities in the top five most dangerous when it comes to the risk of auto theft — it received a “less safe” score, a step above the “least safe” rating. Drivers in Baltimore face a shorter average number of years between accidents (4.7 years) when compared with the other cities at the top of our most dangerous list. The cities with a worse rate of accidents are Worcester, Massachusetts, which is No. 10 in our rankings, and Boston — the 16th most dangerous city, where drivers will see an average of 3.9 years between accidents, the shortest amount of time on our list. Baltimore also has the third-highest relative accident rate in the 20 most dangerous cities when compared with the national average. Springfield is the only city in our top five most dangerous places with less than 200,000 residents. The average time between accidents is 5.2 years, the fifth-shortest average time of all cities analyzed. Springfield also has the fifth-highest relative accident likelihood compared with the national average. Of all cities analyzed, San Bernardino has the third highest rate of fatal accidents per 100,000 residents at 15.8. However, the average time between accidents (8.7 years) is the same as our fourth safest city, Naperville, Illinois. San Bernardino has the lowest annual auto insurance rates of our five most dangerous cities, averaging $1,218, which is just a few dollars more each year than what drivers pay in Fort Collins, Colorado, our third-safest city. Place your cursor in the table and scroll to see all data. Our safest city for drivers is just outside Raleigh, North Carolina. Cary had the second-lowest rate of fatal accidents per 100,000 residents at 1.3. Only Alexandria, Virginia, fared better — it didn’t have any fatal crashes in 2014, according to National Highway Traffic Safety Administration data. Cary, with 155,227 residents in the 2014 census, reported two fatal accidents that year. Cary was given a “most safe” auto-theft risk score and a “safe” motor vehicle larceny score from an analysis of NeighborhoodScout data. Drivers here can expect to pay an annual average of $729 for auto insurance. In Boise, the only city with over 200,000 residents in our top five safest, there’s an average of 13.1 years between auto accidents — the second-longest time without a crash of all of the places we examined. Brownsville, Texas, and Kansas City, Kansas, tie for first place, with an average of 13.3 years between accidents. Boise also has the third-lowest relative accident likelihood compared with the national average. Though Fort Collins is our third-safest city for drivers, it was deemed “less safe” for the risk of car break-ins. The city has the third-longest average time between accidents, at 12.7 years, tying it with Cape Coral, Florida. However, the city has the highest auto insurance rates of our 10 safest cities, with annual premiums averaging $1,212. Naperville is one of two cities in our five safest where the relative accident risk of 15.1% is higher than the national average. However, this Chicago suburb has a low risk of motor vehicle theft, earning it a “most safe” designation. Santa Clarita is the only city in our five safest places that was rated “most safe” when it comes to the risk that your car will be broken into. Although this city has the fourteenth-lowest fatal accident rate per 100,000 residents in our overall analysis, there’s an average of 8.6 years between accidents in Santa Clarita — the same length of time between crashes as in Detroit, the most dangerous city for drivers. The analysis of the nation’s largest cities, according to U.S. Census Bureau data, doesn’t include four cities because of missing motor vehicle theft and auto larceny data. The final list of 196 cities excludes Port Lucie, Florida; Lakewood, Colorado; Pomona, California; and Miramar, Florida. Fatal accident rates were determined with data from the 2014 Fatality Analysis Reporting System from the NHTSA and 2014 population figures from the U.S. Census Bureau. This is 30% of the score. The likelihood of an accident compared with the national average (20% of the score) and the average years between accidents (20% of the score) are from the 2015 Allstate America’s Best Drivers Report. 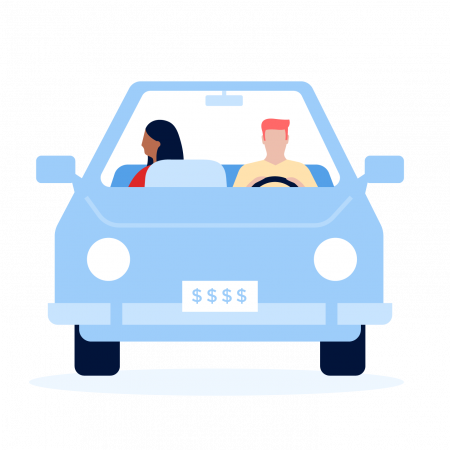 Average annual auto insurance rates from NerdWallet were determined by averaging car insurance quotes for eight driver profiles in each city’s ZIP codes. The profiles include: a 27-year-old single man and a single woman, and a 40-year-old married man and a married woman, each driving a Toyota Camry and Ford Escape. The 27-year-old drivers were quoted liability limits of 30/60/10 (unless the state had higher property damage liability requirements) and uninsured motorist coverage required by the state. The 40-year-old drivers were quoted liability limits of 100/300/100 and uninsured motorist coverage as required by the state. All profiles have a comprehensive and collision deductible of $500. To determine the average rate for each city, we found the average insurance rate for the largest carriers in the state, selected the carriers with the three cheapest averages and averaged those.